The Political Class Doesn’t Care What You Think | Dude, Where's My Freedom? ← What Exactly Do You Want The Government To Do About The NSA? Two headlines that go lovely together. 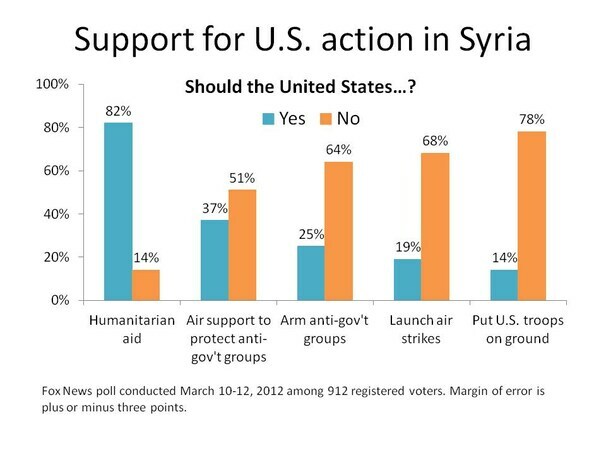 Just file this little nugget away the next time you have to listen to a statist extol the virtues of a “representative” democracy, or laughably claim “we are the government.” The American people overwhelmingly oppose arming the Syrian rebels, under virtually all circumstances. Our ruling class of political elites; however, simply doesn’t care. They’re going to do it anyway. The “Democratic” President has decreed it will be so. The Republican “opposition” isn’t really opposed at all. The only real criticism from the GOP is that they want even more direct intervention, and they wanted it a lot sooner. The two parties have come together in a heartwarming bipartisan compromise, and as usual, such bipartisanship is directed at screwing the public at large and doing something that will make our country worse off. We are not the government. The government is not representative of the public. They are a separate class, committed to ruling over us like cattle, wholly disinterested in our wants, needs, desires, and opinions. They know what’s best (after all, foreign intervention has just worked so remarkably well for us over the last few decades) and they are going to pursue it, “the people” be damned. This entry was posted in News Commentary and tagged bbc, democracy, government, intervention, syria, war, washington examiner. Bookmark the permalink.